We placed an ad on Food and Ranch Jobs for a Yardfarmer. We placed one on Idealist.org for (agri-)cultural revolutionaries. The hope is to spread the word far and wide about our call for contestants–the deadline for which is creeping up soon (August 1st). So if you haven’t started your application yet, get to work! And if you aren’t applying but want to spread the word (to friends, on social media, on your blog, in the media), please do so soon! Thanks! Below you’ll find our Idealist ad. Enjoy! America is facing a converging set of crises–runaway climate change, increasing economic inequities, food deserts, an out of control obesity epidemic, and an industrial agricultural system that’s exacerbating all of these. So what’s a young Idealist to do? We propose moving back in with your parents, or other family members, and turning their yards, and other neighborhood greenspaces, into yardfarms–converting America’s fifth largest crop by acreage (the lawn) into a major new source of sustainable food, household security, livelihoods, and community resilience. While you don’t need to apply formally to become a yardfarmer, we want all of America to follow along with your yardfarming adventures, so we’re choosing six young Americans (21 to 30ish) to be on Yardfarmers, a reality TV show that we hope will inspire Americans to tear up their monocropped lawns and replace them with yardfarms! This way Americans will take the future of their communities, their livelihoods, and their food systems back into their control, and make themselves ready for the changes Mother Nature is going to throw their way. The show will be filmed from March 2016 until November 2016, so applicants need be able to commit to be being a yardfarmer during that time, and be willing to be filmed while they do. The show will then air in March 2017. No farming experience is necessary–just a commitment to convert lawns around your neighborhood into productive yardfarms. All contestants will receive a crash course in permaculture in March at the Ecovillage Training Center in Tennessee (all expenses paid). Contestants will also receive training in filming so they can film their yardfarming journeys. 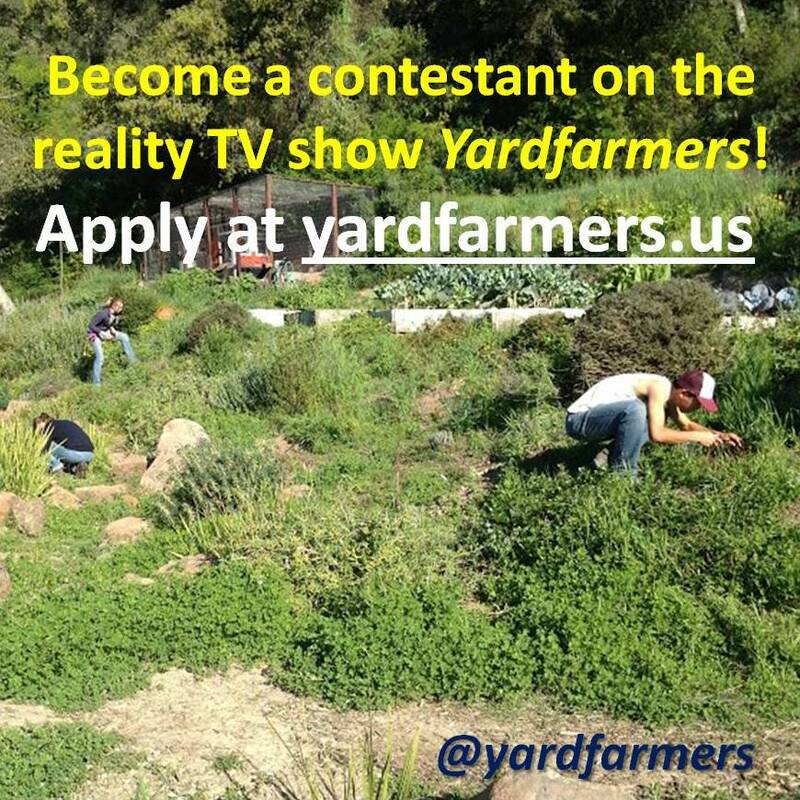 Go to http://yardfarmers.us/call-for-contestants/ and click the “Apply” link to fill out the application form. Video submission is a required part of the application process. Applicants can be based anywhere in America. Application is due August 1st. Compensation: Health insurance, student loan repayment assistance, plus stipend for completion of full growing season. Winning yardfarmer will receive a significant cash prize.